Didn't the winter special that aired cover the entirety of the manga? I hope Netflix gets the rights to the live-action movie. I really want to watch it. Actually they skipped about a volume or two of material entirely and some other chapters were briefly summarized in the special. The special episodes were added on Netflix this month. I understand your frustration. Netflix didn’t even bother translating the episode titles... Also, I hate how they wait until the end of the season (or more) to release the episodes. I went elsewhere to watch the special episodes as I got fed up waiting for Netflix to release them. Episode title cards aside, the Netflix subtitles are much better than Funimation's. 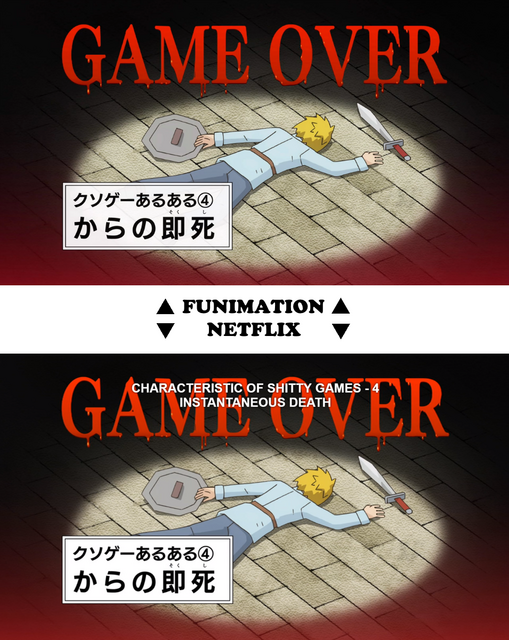 Compare the bad video game episode if you want a good example of how Funimation struggled with the show. Neither are perfect though, as I think you'd need a player capable of handling subtitles better than either site has to truly do the show justice. What Netflix definitely did for the show outside of Japan (and possibly inside too) was find it an audience that it wasn't finding lost in the shuffle on Funimation's site. Looking forward to more, as it's the rare anime comedy that I find eminently rewatchable in a way that a classic sitcom is to me. I'm somewhat surprised, given Netflix never bothered to commission a dub for the second series. They're on but they're barely watchable compared to the dubbed version. Rapid fire comedy + visual gags + reading is not a mix ripe for entertainment. "Netflix, what do you mean by new series?" I need that answered first... it's the new series, it's the material they skipped, it's a total reboot, it's whatever Netflix is paying for. I know it's the last one but I don't know what that is. This is great news, but I wish they had done this before the finale special, which covered the last chapters that ran in Shonen Jump. It will be awkward for the show to go back in time after that, but there's certainly enough material skipped by the previous seasons to fill 12 episodes or so. Also, I'm hoping to see the two Jump GIGA chapters adapted, since they're the manga's actual conclusion. Yeah, I don't believe for a minute that Netflix can produce better subtitling than Funimation. You're basically saying you liked one translation better than the other, unless you're seriously suggesting that Netflix's subtitling text is somehow more attractive than Funimation's. Netflix gave Saiki a broader audience outside Japan? Citation needed. Netflix 'stole' the rights to Saiki and virtually condemned it from getting any sort of western release, so how does that increase its accessibility? What, you just assume that every otaku in the world has a Netflix account? Netflix needs to keep its greedy hands off of anime. Absolutely terrible news. I figured most of Saiki had been animated, but I guess I was wrong. Nice to see Netflix putting money in to getting a series continued. Hopefully they do this more often. Why Netflix didn't work with Funi to have the latter give more of the Saiki franchise an Eng. dub and the former stream it is beyond me. If this was the case, Funi defiantly would have done some tweet announcements saying something like "Though it is on Netflix now, more Saiki got an Eng. dub with the cast reprising their roles". Netflix would have probably just tweeted "More Saiki coming on [date]". I gave an example, and if you didn't check it out for yourself, then I'm probably a fool to try and argue with your prejudices. But here's a comparison from that example. The Funimation subtitles didn't bother with on screen text in that episode, which is where some of the jokes lived. Interest in Saiki K spiked and sustained when Netflix picked it up. And I am not assuming every otaku in the world has a Netflix account, because I am not limiting myself to the idea that only "otaku" can watch and enjoy anime. Netflix brings anime to a much wider audience than a narrowcast site like Funimation or Crunchyroll can. Why Netflix didn't work with Funi to have lattre give more of the Saiki franchise an Eng. dub and the former stream it is beyond me. If this was the case, Funi defiantly would have done some tweet announcements saying something like "Though it is on Netflix now, more Saiki got an Eng. dub with the cast reprising their roles". Netflix would have probably just tweeted "More Saiki coming on [date]". What reason would Netflix have to work with a competitor? Funi does have a dubbing studio but they are primarily a licensing company with a competing streaming service. And what position would this put Funi in? Promoting a dub they did for a service that isn't Funimation Now would be odd. What Netflix could have done is hired one of the numerous Texas-based dubbing studios that are run by active Funi VAs. They could've easily got the same cast, and hell, even director, back again. But that would require effort from Netflix to appease anime fans, and as the trends have indicated, they do not seem care about those. If we do get a dub I am willing to bet it will be Bang Zoom one with an all new cast.